Are You Stealing Opportunity for Character Development From Your Scouts? When I bring up the prospect of a ski trek, I expect these sorts of reactions from some mothers, a few fathers, and certain types of boys. I don’t expect them, nor do I hear them, from the types of boys that love adventure – which lies at the heart of most of them. The types of boys that love adventure and are willing to try anything are the types of boys that Baden Powell served, and the types of boys that will perhaps flourish the most under the Scouting program. A troop that doesn’t offer grand adventures, like ski trekking, isn’t a bad troop, per se. 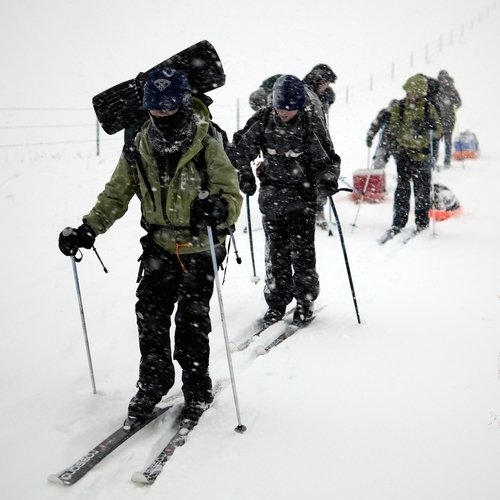 Ski trekking, 50 Milers, and rhino wrestling aren’t required in order for a troop to carry out the BSA’s Mission and Vision, and sanitary outdoor activities like summer camping near cars and other picnics can be designed with enough justification that a troop is even carrying out the Aims and Methods of Scouting. After all, the development of character in a boy really is the most important thing – not whether or not he knows how to pack, or pull, a pulk across Montana. And if you don’t flex it, you won’t develop it. I propose that one can maximally develop strong character only through a combination of mental, physical, emotional, and spiritual hardship. There are no shortcuts. While you develop some, you don’t develop *much* character by speaking to your boys (but don’t stop doing this), helping them memorize the Scout Oath and Law (don’t stop doing this, either), or reflecting on how bad the ants were at the annual Troop picnic (please stop doing this). I propose to you that an essential part of developing strong character in a boy is by exposing them to a consistent, challenging, and exciting program of multi-day outdoor adventures that test their physical strength and endurance, maximize their ability to rely on each other to accomplish the adventure’s objectives, and offer opportunities for failure with a lack of guaranteed outcomes. 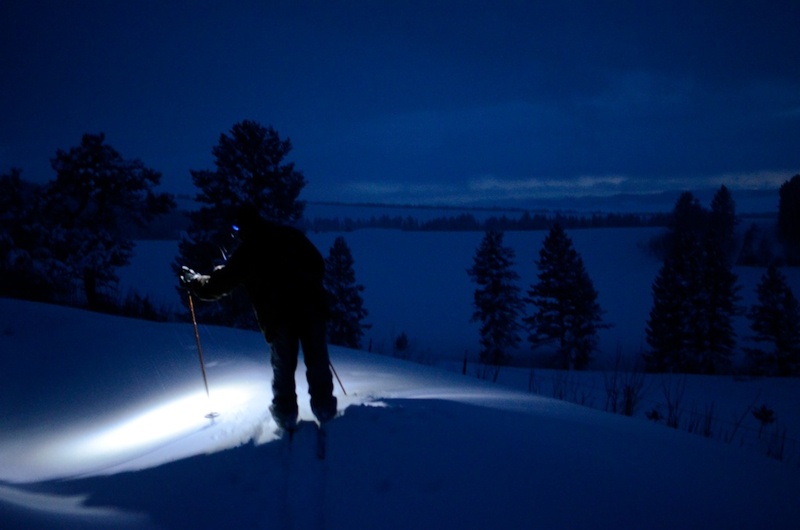 Troop 676 Scouts embark on a 3-day ski trek, starting in the waning evening hours of a Friday night after a long week of school, pulling pulks towards the wilderness of the Crazy Mountains. Ryan Jordan photo. There isn’t one way to develop character of course, and good character can be developed outside the framework of outdoor adventure. Why would you steal that opportunity from your Scouts? If you are not providing opportunity for the boys in your troop to flex their physical, mental, emotional, and spiritual muscles – all at once – and in the absence of The Net (you know the one – the net that removes all risk, all guarantees of failure, and protects you from fielding complaints from Scouts and parents) – and you are not doing this outside and away from all the stuff that dilutes their engagement (electricity, car heaters, radios, fluffy beds) then you are robbing them of their full potential. Don’t be a thief. Sleep on that. And then, when you wake up, call your Senior Patrol Leader, and start a brand new day. Let your boys explore their wild side – outside. They’ll thank you for it. Ryan Jordan is an Eagle Scout, former High Adventure Director and Trekking and Mountaineering Guide at Camp Parsons (Chief Seattle Council), and currently, serves as the Scoutmaster of Troop 676 in Bozeman, Montana and as the High Adventure Committee Chair for the Montana Council. Ryan has a heart for training Scout leaders to do epic things with their boys and is the lead instructor for the BSA High Adventure Leader Training School offered by Backpacking Light and the Montana Council.